Pure Ivory dupioni silk fabric tone-on-tone. Brand New High-End Dupioni Silk Fabric Yardage. 45 inches wide. This is sold by the yard so this listing is for one yard. You can choose how many yards to buy by entering the number in the quantity field. You will receive one continuous piece up to 30 yards. Total time to reach you anywhere in the USA: 3 to 5 business days including handling time. 3 business days to the Midwest and 4 business days to the East Coast. Very quick delivery! *Dupioni Silks are available in either iridescent or tone-on-tone colors. *Our dupioni silks are handmade and have a texture. *This is a medium weight but on the heavier side dupioni silk. As one customer told us, "Yours is an excellent quality and it has a nice body to it and is not flimsy like many others". *It is highest quality dupioni you can find. 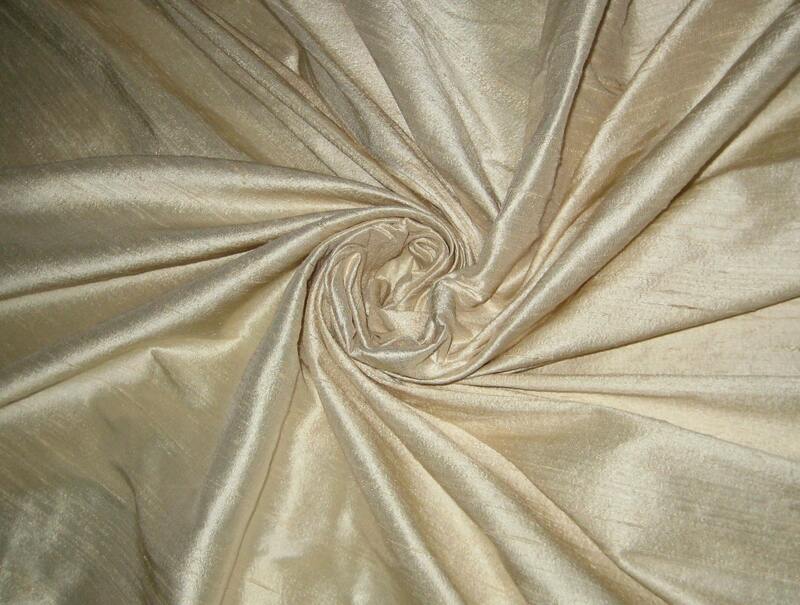 *This dupioni is perfect for bridal & bridesmaids dresses, drapery, quilting, pillows, & chair upholstery. If you want to order a 2 inch x 2.5 inch dupioni fabric swatch to see the exact color, search for swatch in our store. Swatches will be $1.50 per swatch including FREE USA shipping. You can contact us for a custom listing. We reply to questions quickly because we check our messages very often so do not hesitate to ask us. *1 to 4 yards $20.99 per yard + your shipping charge covers 2 to 3 days First Class shipping in the USA or First Class International service. *5 to 9 yards $20.99 per yard + your shipping charge covers 2 to 3 days Priority Shipping in the USA or First Class International service. $19.99 per yard for USA and for international customers. Ask us for international shipping quote. *21 or more yards per listing Buy the bolt with a minimum of 32 yards for $575 per bolt plus shipping. To buy a bolt, click on the category "Wholesale Dupioni 32 yds" on the very left. PRIORITY shipping is available worldwide at checkout if you want to upgrade from First class. PRIORITY EXPRESS shipping is available worldwide at checkout if you want to upgrade.